Universal asked us for partnership ideas to help promote their new animated cinema release from Illumination, The Secret Life of Pets. As a new movie franchise in a market of well-established movie characters, our client wanted to bring to life the animal characters’ personalities, positioning it as an all audience film. Given the film’s title and storyline and the UK population’s obsession with its much-loved animal friends, we focused our immediate attention on securing a brand partner offering pet-related products and services. Approaching Allianz’s Petplan – the UK’s favourite pet insurer – we established that the brand was looking to build salience and reach among pet owners in order to drive sales of their pet insurance policies. 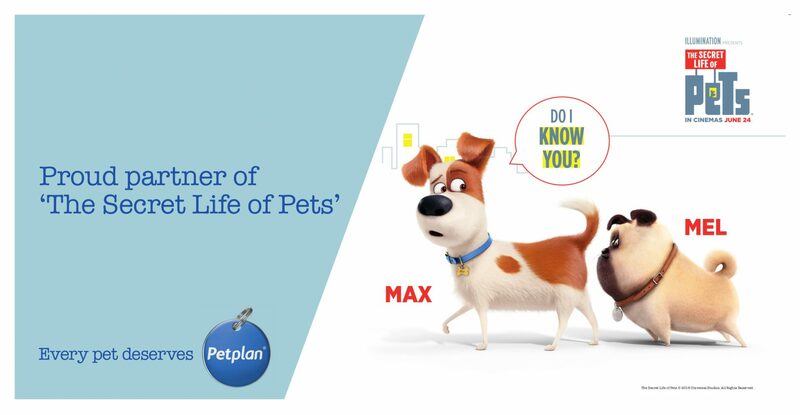 The Secret Life Of Pets presented the ideal solution, enabling Petplan to leverage the engaging characters in The Secret Life Of Pets for an integrated campaign. This was achieved through reimagining Petplan’s ‘Your Job, My Job’ TV campaign, where The Secret Life Of Pets film footage featured the pets doing various ‘jobs’ before inviting viewers to do their ‘job’ and look after their pet with insurance from Petplan. Character imagery and assets were also used in outdoor, print and digital media. Consumers were incentivised to visit the Petplan website to apply for a policy with the chance to win an exclusive The Secret Life Of Pets pet blanket. Petplan’s also embraced social media to bring to life the content and assets from the film, knowing that videos of animals are among the highest viewed online. For Petplan, the campaign exceeded all targets, delivering 9% more sales and 17% more revenue year on year, with an increased number of visitors to the Petplan website of 8%. In addition, Petplan saw 3.5% more pet owners starting a quote online than the previous year, with a social media engagement rate of 28% versus a 5% benchmark. For Universal, the movie opened at No.1 in the UK box office, becoming the biggest original IP animation in the UK. The partnership was awarded Gold at the Screen Awards, the UK film industry’s awards ceremony recognising excellence in film marketing and distribution.